Monogram Stickers – their many uses! Monogram Stickers are extremelly useful indeed. They provide endless solutions to every day situations, and you’re bound to need them at some point! Whether it’s numbers or letters that you will find the most useful, you can personalise your possessions with our sophisticated and elegant monogram stickers. They’re all made from the quality brushed aluminium. messgae will not only be very clear but will sparkle with fantastic design too! With our sticker packs you will never be lost for words. 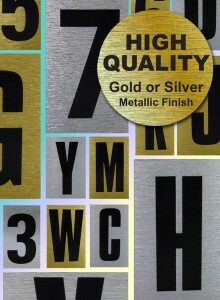 No matter what information you would like to display you will find the perfect lettering here. Our monogram stickers are completely self adhesive, which means that as long as there’s a clean, dry, smooth surface – you can stick it to it! You don’t need to worry about quality when you buy from us as we use a high standard of quality inks, giving you complete satisfaction and durable stickers with your purchase. You’d probably also like to know that we print all of our products right here in the UK and adhere to the quality standards applicable. This gives you the confidence to use our monogram stickers in and around your home.